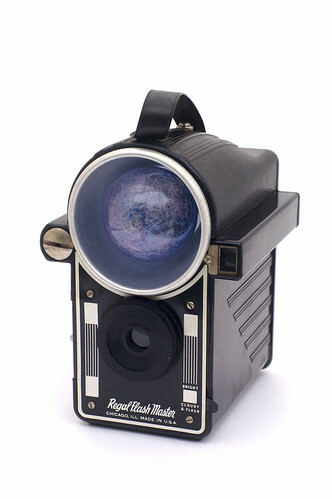 Introduced as the Falcon Press Flash and Falcon-Abbey Electricamera by the Utility Manufacturing Company in New York, this was the first camera with built-in flash reflector. The Abbey branding may relate to another New York company, Abbey Photo Corp., who sold flash synchronizers . 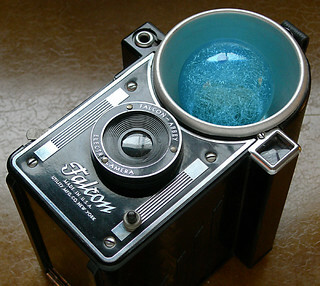 It used old-style Edison screw-base flash bulbs, and 120 film rolls for exposures 2¼×3¼". It had two exposure settings, one for "bright" light and one for "cloudy & flash" situations. The name changed to Spartus with the Chicago company's acquisition of Utility. Aside from the cosmetics of the front plate, the same design was marketed from 1939 to 1950 under several names, including Regal Flash Master, Falcon Press Flash, and Galter Press Flash. The body was a ribbed bakelite mouldings. ↑ An example can be seen here (view larger), from Totem Pole Playhouse on Flickr. ↑ See the bottom of this May, 1940 advertisement in Popular Photography magazine (Vol. 6, No. 5; page 57). ↑ McKeown, James M. and Joan C. McKeown's Price Guide to Antique and Classic Cameras, 12th Edition, 2005-2006. USA, Centennial Photo Service, 2004. ISBN 0-931838-40-1 (hardcover). ISBN 0-931838-41-X (softcover). Page 943. ↑ As seen in a January 1940 advertisement in Popular Photography (Vo. 6, No. 1) page 88. ↑ This Spartus Press Flash is labelled with "Mfd. by Galter Prod. Co."; photographed by Peter M Lerman on Flickr. See The Chicago Cluster for more probably-related cameras and "companies"
This page was last edited on 18 January 2017, at 09:41.